Drain pineapples, saving syrup. In mixer bowl, combine cheese, 1/2 cup of sugar, egg yolks, lemon peel, and vanilla. Blend at medium speed and stir in pineapple. Place 1 phyllo leaf in greased 9 x 13-inch pan. Brush leaf with melted butter. Repeat with 7 additional leaves. Spread pineapple-cheese mixture over phyllo; top with remaining 5 leaves, brushing each leaf. Score top leaves with sharp knife into diamond shapes. Bake at 350° F for 50 minutes, or until golden. Combine 1/2 cup sugar with 1/2 cup of pineapple syrup and lemon juice. Cook to a thick syrup. 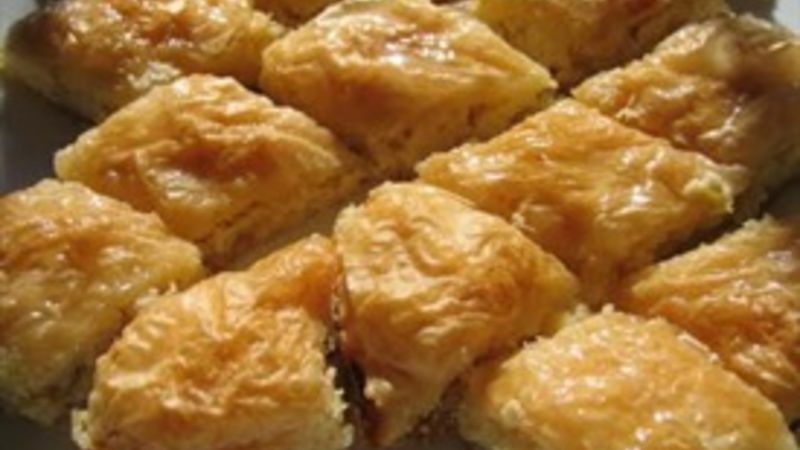 Spoon syrup over finished baklava while both are still hot. Cool and cut at markings.